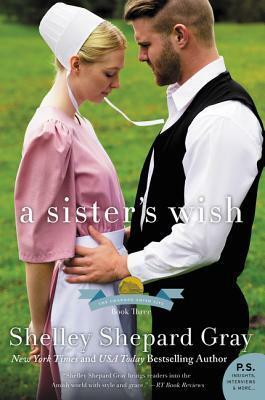 Today I am reviewing A Sister’s Wish… the third book in The Charmed Amish Life series by Shelley Shepard Gray. She’s been in love with bad boy Simon Hochstetler for as long as she can remember. Too bad he’s about as far from “perfect” as an Amish man could get… but that’s exactly why she’s so drawn to him. For years, Simon Hochstetler has been in love with Amelia Kinsinger. Unfortunately, Lucas Kinsinger, Amelia’s brother, told Simon in no uncertain terms that he wasn’t the man for Amelia. Not only does this news hurt Simon, but it also hurts Amelia deeply. So much so that she . . . well, I can’t exactly tell you what she does, can I? I really don’t want to spoil this wonderful story for you. You need to read it on your own. But please let me encourage you to read it. In fact, read the whole series. You’ll be blessed by it. A Sister’s Wish was a beautiful story to read. So many gems to glean from this series by Shelley Shepard Gray. Looking forward to reading the series. Thank you for the review, Donna.